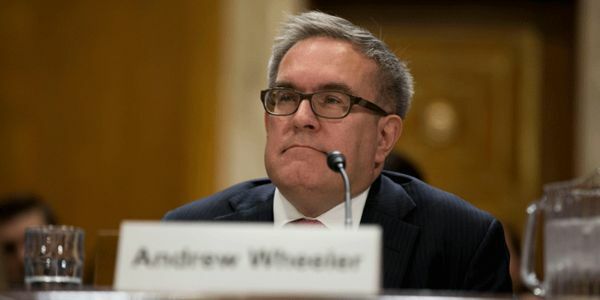 Since he became Acting Administrator of the Environmental Protection Agency — after a swell of grassroots activism forced his predecessor, Scott Pruitt, to resign his post — Andrew Wheeler has ignored sound science and attacked safeguards that protect us all against harmful pollution. In his almost seven months on the job, he has led efforts to weaken or eliminate meaningful limits on the largest sources of climate pollution, including smokestacks, tailpipes, and oil & gas facilities. If he&apos;s successful, his work will lead to billions of tons of additional climate pollution. And now, President Trump has nominated to be the official EPA Administrator. Take action today, and tell your Senators to stand against this dangerous nomination. I am gravely concerned about President Trump's decision to officially nominate Andrew Wheeler to take over as EPA Administrator. In his acting role at the helm of the agency, Wheeler has already put industry interests above the health and safety of the American people. We cannot allow that to continue. Please oppose his nomination and call on the President to nominate an EPA administrator that supports EPA's bi-partisan mission of protecting public health and the environment.